Unprotected sun exposure is the number one cause of premature skin aging and skin cancer. Unfortunately, many people still don’t take it seriously and are not doing enough to protect their skin. We’ll give you a deeper understanding of how sun damage affects skin and the key steps to reduce its risks. There are two main types of UV rays that cause sun damage: UVA and UVB. UVA (longer-wave) rays activate skin in an unhealthy way to become tan, but they are not the rays responsible for sunburn. UVA rays go far deeper into skin and trigger skin-cancer and premature aging damage. UVB (shorter-wave) rays are responsible for causing sunburn and also trigger premature aging damage. UVB is considered the common cause of most skin cancers. Beyond the short-term consequences, sun damage has far more serious long-term repercussions for skin. Essentially, sun damage destroys skin’s ability to maintain the vital components (such as antioxidants, essential fatty acids, ceramides, hyaluronic acid, and vitamins) it needs to look young and healthy. Increased fine lines and wrinkles. Skin discolorations and uneven tone. Buildup on the surface layer, resulting in dull, congested skin. UVA sun damage is more insidious because you don’t feel any pain or discomfort from it, yet it is destroying skin nonetheless. Over time, this causes skin abnormalities, resulting in the worst forms of skin aging and a more pronounced risk of skin cancer. Prevention is the only way to truly save your skin—once damaged, there is only so much you can do. That means wearing sunscreen rated SPF 30 or greater, every day, rain or shine. It’s never too late to start using an SPF product, but the sooner the better. Keep in mind that if you’re going to be outside for long periods of time or sweating a lot, you will need to reapply your SPF product regularly to ensure you are getting full protection. 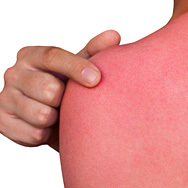 Also, be aware that some medications can make your skin more sensitive to the sun. Lips can get sun-damaged too. Protect them with a lip balm with SPF, and reapply it regularly because eating, drinking, and even talking will make it wear off. AHA or BHA exfoliant: Helps remove the buildup of unhealthy skin caused by sun exposure, restoring smoothness, improving skin tone, and leading to an overall more radiant complexion. Retinol: Visibly diminishes the appearance of wrinkles and other signs of aging caused by the harmful effects of the sun. Vitamin C: Dramatically brightens uneven skin tone brought on by sun exposure. Antioxidant serum: Helps shield skin against environmental damage and boosts the efficiency of your SPF product.